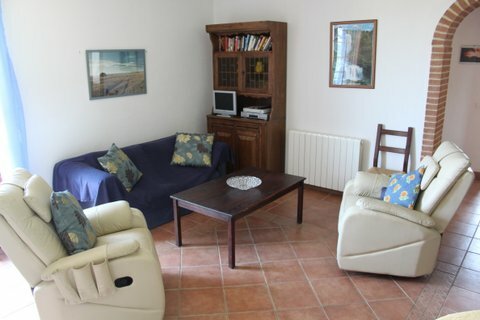 From an independent entrance, the apartment opens into a spacious, living room furnished rustic style. The living area has a sprung double sofa bed and two leather reclining armchairs and coffee table. the dining area has seating for six around a circular table and a dresser housing six piece cutlery, crockery & glassware. 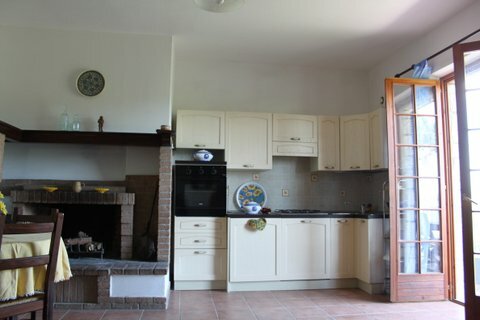 The well fitted kitchen area has an electric oven, gas hob, Moka coffee maker, toaster, juicer and a good selection of cooking utensils and pans. In the summer the apartment remains cool and airy but it is also ideal for out of season booking with a lovely open fire & central heating, just right for cosying up to with a glass of wine. For our guest’s entertainment the apartment is furnished with TV (sky package with English language selection), a DVD player and broadband collection. There is also a selection of books, games and DVD’s in the foyer leading to the apartment. 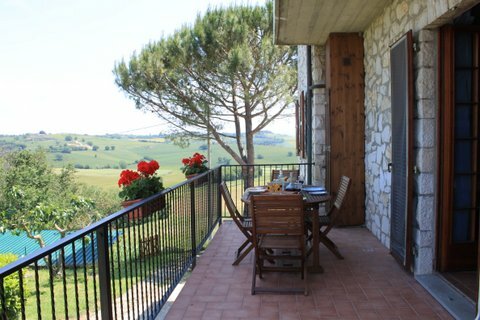 French doors open from the living room on to a good size balcony which catches the early morning sun with views over our olive grove towards Gioiella. It is perfect for relaxing with a glass of wine after a day’s sightseeing and letting the world slip on by for a change. From the living room an archway leads to the bedroom area, where there are two double bedrooms and a good size shower room. 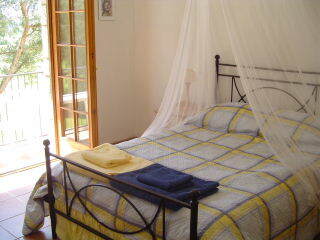 The main bedroom is fitted with a comfortable double bed and white washed furnishings. A second balcony running the length of the apartment, is accessed from this room. The balcony is sunny all morning with views through Umbrella Pines over fields of grain & sunflowers to Lake Chiusi glistening in the distance. The second bedroom is furnished in rustic style with washed blue single beds and white wardrobe. All rooms have bedside tables and bedside lights and are fitted with mosquito nets, plugs and fan. A cot, high chair and baby bath are also available for our youngest guests and we can add a third single bed if required. Welcome pack provided. Home produced extra-virgin olive oil, fresh eggs and wine offered for sale.